January 22 – January 28. 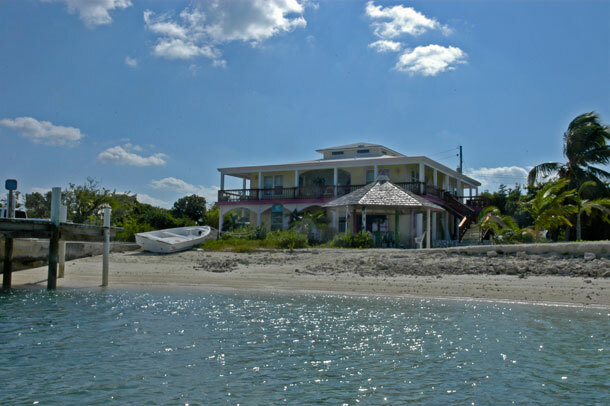 We are at the fuel dock of the Staniel Cay Yacht Club marina. Duwan is putting water into our tanks. It’s a slow process. I’m finished with the diesel, so I have time to gaze around. SCYC is the only option here. The docks at Happy People marina have been damaged by weather, and the Thunderball marina looks (very) closed. There has been a steady stream of customers fueling up today. 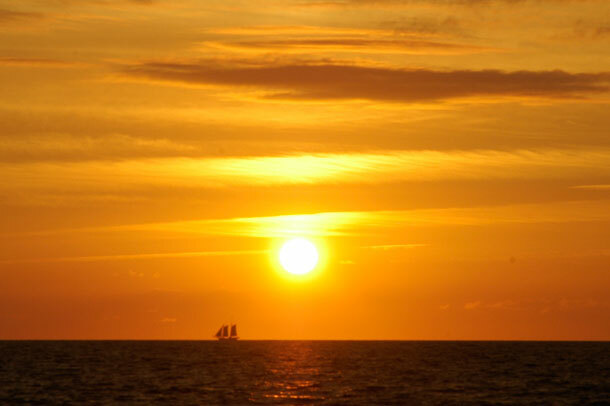 We’ve waited for a break in the flow to come over. No one greeted us when we arrived. No response on the VHF, so I went down the walkway toward the bar to find assistance. Out of habit I looked at the water height on the rocks to measure how high the tide was. When the dockmaster was able to break free from helping new arrivals he came out for us. Now I see that a couple of boats are out in the current, waiting for us to finish, trying to hold their positions. There is plenty of dinghy traffic from cruisers anchored nearby. There are also a lot of small motorboats, Boston Whalers from the colorful rental cottages, traveling to and from the area’s attractions. The wind is up. A guy in a small sailing skiff has tipped over too far, swamping his boat. A passer-by stops to hold him steady while he bails. Where’s everyone going? Well, there’s a lot to do here. It’s only a mile to pig beach at Big Major’s Spot. Closer still is the Thunderball Grotto, where you can snorkel through a skylit cave. They say to go at low tide. We learned it’s better to go before the tide change and swim in when the flow is completely slack. 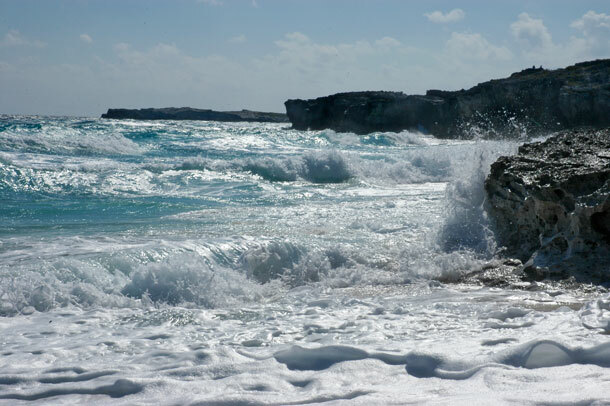 Even shortly after low tide the current was so strong I could barely swim against it. 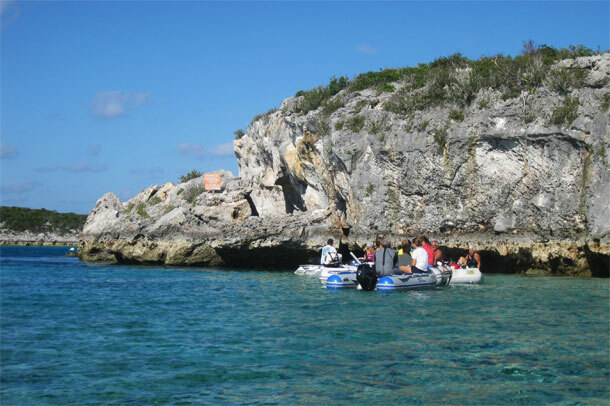 The name Thunderball comes from the James Bond movie, some of which was filmed in the grotto. 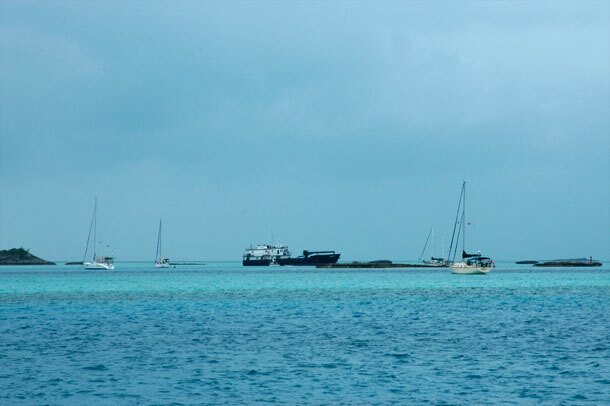 There are two wrecked planes to see in the waters off Staniel, and plenty of small deserted cays to check out. The big excitement here happens on Saturdays when the supply boat comes in. It ties up at the government pier, and couple of hours are spent unloading goods for the Pink store, the Blue store and for Isle’s General store. Isle’s stays closed until all the produce is put on the shelves. There is no set time. The supply boat may have been held up by tide or weather. There may be lots of stuff to inventory. So the cruisers just gather under the gazebo outside and wait. But when the doors open it’s so nice to see shelves full of fresh vegetables, where there were only onions and potatoes the day before. Now Duwan is finished with the water. I tip the dock guy, before he disappears again, and I walk to the bar to settle up. There is a sizable lunchtime crowd, so it takes a while to pay. I can feel the impatience of those boaters out there waiting for us to leave. Walking back to our boat I see that the tide has gone down five inches since we arrived. Oh well, as the sign under the cash register at the bar says ‘What’s the hurry? You are already here’. 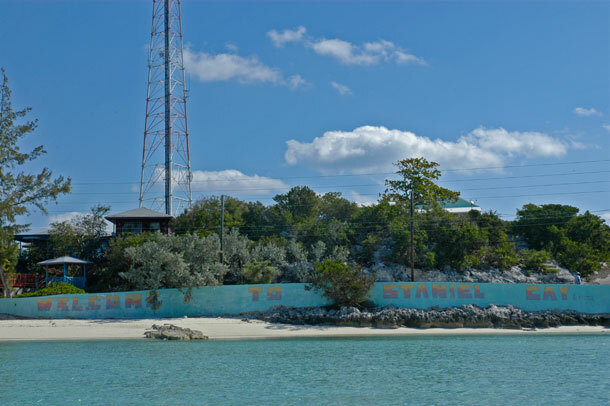 So if you want to spend your vacation idling away the hours outdoors, come on down to Staniel Cay. Better wear your Teva’s in case you want to climb on rocks. And make sure your hat has a chin strap, so it won’t blow off. Rental cottages with their Boston Whalers. Entrance to cave at Thunderball Grotto. 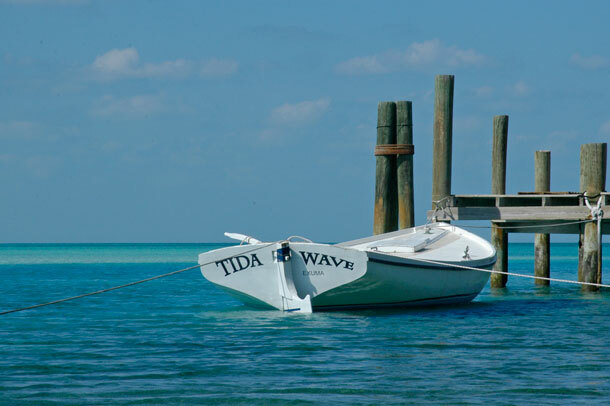 Championship racing boat Tida Wave. Prince Philip once took a ride in her. The rudder from that trip hangs nearby in the Royal Entertainer lounge. Isle’s General Store with waiting gazebo out front. The supply boat leaves. Better rush to Isle’s General before all the fresh produce gets snapped up. 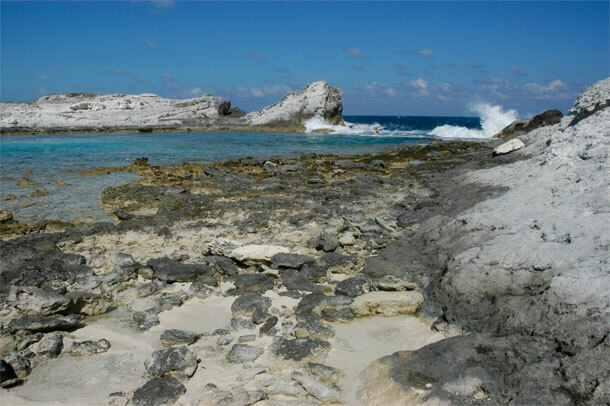 Northeast shoreline of Staniel Cay. 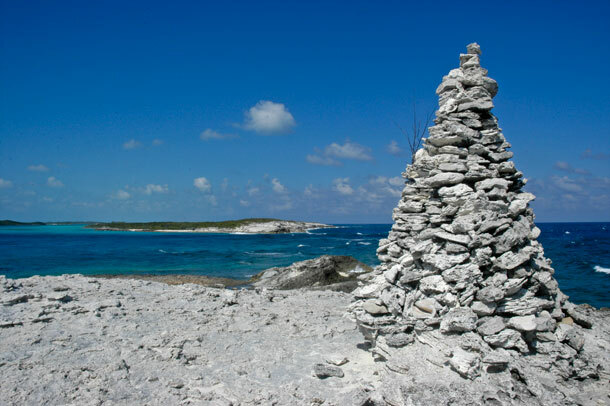 Entrance to tidal pool at Staniel Cay. 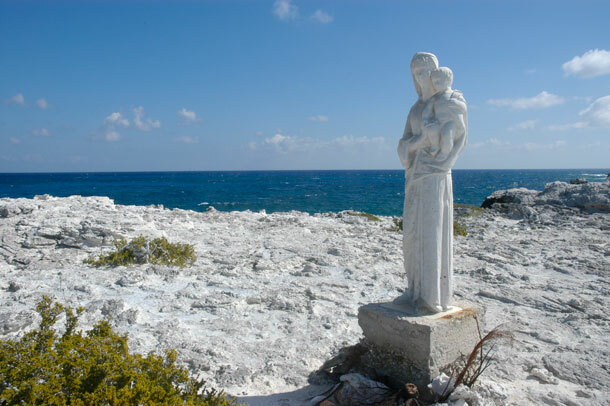 Staniel Cay’s Madonna stands 60 feet above the Exuma Sound (in the background). Someone went to a lot of trouble to bring her here and pour her a pedestal. It took us a half hour to walk and climb over rocks to get to this point. Cairn overlooks Big Rock cut. 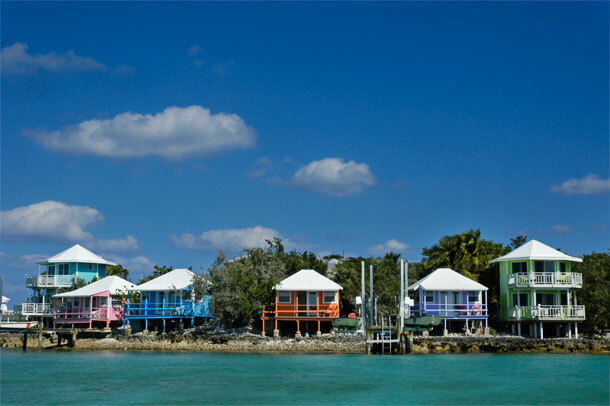 Exuma Sound is on the right. Little Major’s Spot is ahead.